I’ve been sharing a lot of great things to do in Boston and less about the every day budget side of things. Since becoming a mom a little over a year ago, all things baby have consumed a lot of my time– and my budget too. Kids are expensive. I wanted to do a post on how I find (NEW!) clothes for my baby without spending too much money. Kohl’s is my #1 place for finding new baby clothes on a budget, whether it is in-store or online. Kohl’s is a great store to shop at because the savings can really add up. 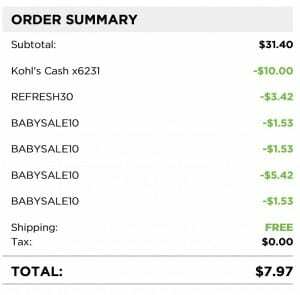 Kohl’s allows 4 promo codes per online transaction (only 2 for mobile) which makes stacking codes easy and fun! Right now Kohl’s is currently having a baby sale. You can save $10 when you purchase $30 or more when you use promo code BABYSALE10 at checkout. 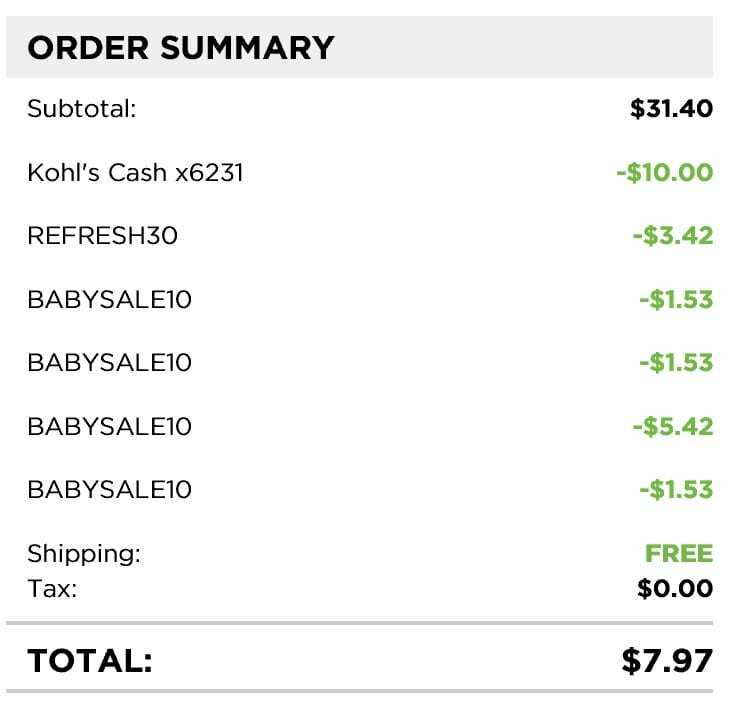 Kohl’s cardholders can also get 30% off your purchase when you use promo code REFRESH30 as well as get free shipping with promo code FREE4MAY. If you are not a cardholder, you can use promo code TREEBUD for 15% off and free shipping starts at orders of $75 or more. If you spend more than $200 a year at Kohl’s, you may want to consider getting the credit card for all the great perks. It’s one of those few store credit cards that are worth it in my opinion. In the transaction above, you can see that I also used Kohl’s cash. I also have a Discover card and checked the rewards center. They had an offer sitting in my account for $10 of purchases of $30 or more. (My husband also had the same offer– so check your account!) I was able to apply that discover coupon code to my account, without using my discover card for the purchase. I had to spend at least $30 for the deal above, but had two $10 off coupons and a $30% offer. I was able to get 5 items (including PJ’s) for $8– which is a great deal! Final Cost $15.38 shipped– only $1.54 per bodysuit! These promo codes end on May 23, 2016 and there are many different scenarios for some great baby deals at Kohl’s! I got great deals on pajamas and summer t-shirts because that’s what I needed, but you can apply the promo codes to almost anything! You can also print out a savings pass and do this deal online if you are not a cardholder and won’t be able to do free shipping. The price would just be slightly higher without the 30% discount. Kohl’s is one of my favorite places to grab baby clothes as there’s so many great deals! Do you have any tips for saving money on baby clothes? When you have a toddler who is always running here and there, you will need a lot of spare clothes for him. But if you are into budget parenting where else can you find clothes in affordable price. Well, its of course on online bargain sites. This Kohl’s one seems interesting. I think I’ll give it a go. Thank you.